Versatile corrugated cake boxes from New Method Packaging. If you need versatile, durable corrugated cake boxes for your bakery or restaurant, then we have exactly what you need. 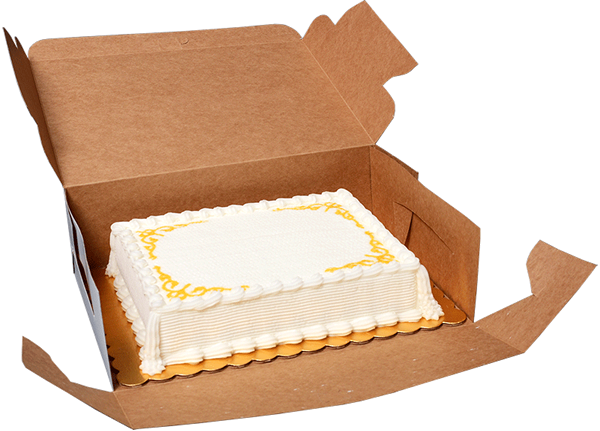 We manufacture corrugated cake boxes that can be used to hold and transport different kinds of cakes and baked goods. For more than 30 years, we have been an industry leader in the design and manufacturing of bakery packaging products. You can trust that our carryout boxes will meet your expectations. These sturdy boxes are made from 150# B-flute corrugated paper and come in various sizes. Each box features a plain white finish. They fold up just like a pizza box and have a fold-over end and a top that tucks in. You can order them in plain white or with pre-printed stock graphics. All of these cake boxes are recyclable and can be composted. They are perfect for busy delis, restaurants and retail bakeries that offer pick-up and carryout service. We manufacture our corrugated cake boxes in many different sizes. Please select the product you are interested in. If you are interested in purchasing pizza packaging products from a distributor, please review our shipping area. Enter the name of your current distributor. We offer a full line of corrugated bakery packaging products. We offer various types of bakable, disposable packaging, including P.E.T. laminated products. Let us be your one-stop shop for all of your pizza packaging needs. Take a closer look at some of the products we offer. For more than 30 years we have been industry leaders in the design and manufacturing of corrugated food packaging products. We focus on high-quality products and on-time delivery. We offer a full line of stock bakery packaging, pizza packaging and ovenable packaging products. Our in-house capabilities also allow us to offer custom product design and printing, including custom shapes.Look not further than New Method Packaging to be your one-stop shop for all of your corrugated food packaging needs.